There has been no global warming now for 17 years and nine months. According to the RSS satellite data, whose value for April 2014 is just in, the global warming trend in the 17 years 9 years since August 1996 is zero. The 212 months without global warming represents more than half the 423-month satellite data record, which began in January 1979. No one now in high school has lived through global warming. 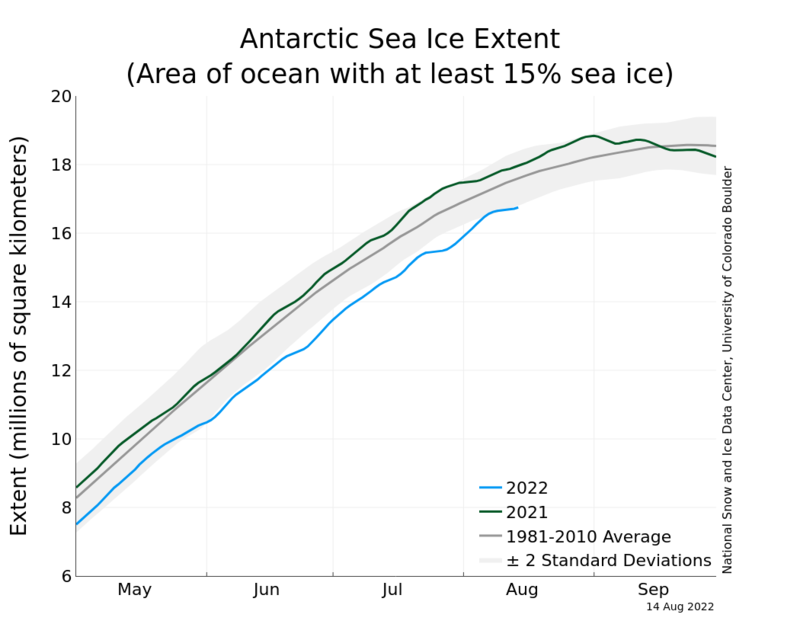 Add to that this chart of sea ice extent where the Antarctic sea ice extent is growing and well outside, not just the average extent for 1981-2010 but now way more than 2 standard deviations. Part of East Antarctica is more vulnerable than expected to a thaw that could trigger an unstoppable slide of ice into the ocean and raise world sea levels for thousands of years, a new study shows. Antarctica, the size of the United States and Mexico combined, holds enough ice to raise sea levels by some 57 metres if it ever all melted. “It sounds plausible,” Tony Payne, a professor of glaciology at Bristol University who was not involved in the study, said of the findings. The region is not an immediate threat, he said, but “could contribute metres to sea level rise over thousands of years”. Ice melts at temperatures above zero degrees celsius…even in summer the temperature at the South Pole averages -25.9 for the highs and the warmest ever in summer it was still -7. The chances of all of Antarctica melting away is bloody sero, and yet these muppets still go on about scenarios that cannot and will not ever exist. In any case even if their nightmare, catastrophic scenario was true it would take 200 years for it to happen…you don’t think humanity would find a solution in that time?